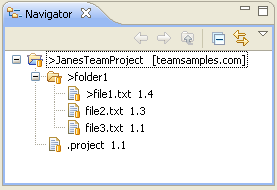 In one of the navigation views select the file1.txt. The history view will open and display the revisions available for the selected file. Make sure that the history view is in Remote Revisions mode. (If it is not you can put it in Remote mode by clicking on the Remote Revisions button in the History view toolbar.) Select revision 1.3 in the table and from the pop-up menu choose Get Contents. Observe that the navigation view updates to show the CVS state of a resource. Notice that the modified file is preceded by ">" indicating that file1.txt has changed (by replacing it with the earlier version). Now assume that this older revision is not as good as it initially seemed and in fact the revision in the repository is better after all. Instead of choosing Team > Synchronize with Repository, choose Replace With > Latest from HEAD. Observe that file1.txt is updated to have the same contents as the latest revision from the repository, and that the leading indicator ">" has been removed since it is now the same revision as the repository. Now that you have a file's revisions displayed in the History View, it is possible to compare revisions directly by selecting the revisions in the table and choosing Compare With Each Other.